Photos taken of me by Dana McGlockling of Urban Utopia Photography Copyright 2015. 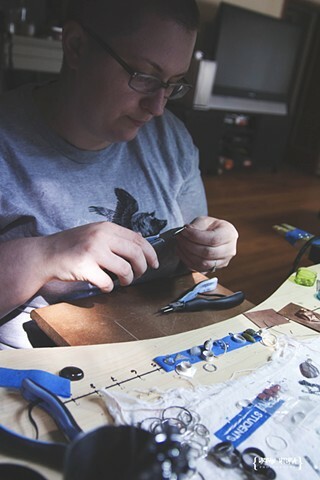 I make my jewelry a variety of ways, with most of the jewelry you see on these pages being made by my hands, completely, with a few exceptions. 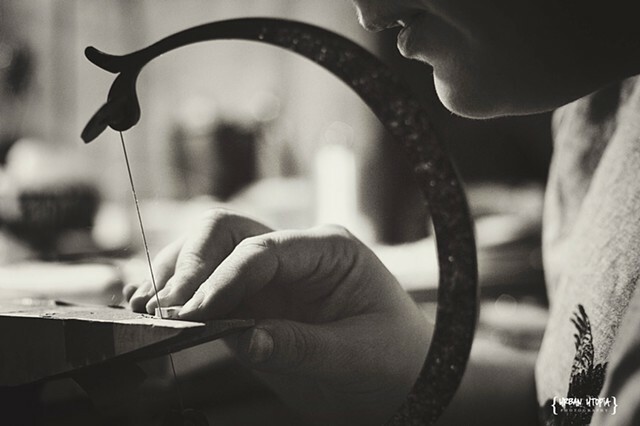 I have three distinctly different lines of jewelry I create. 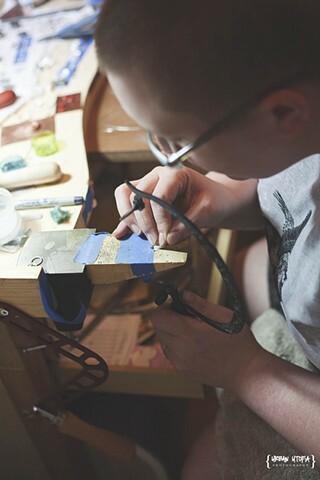 The first and most affordable is my production line of vintage style jewelry, created used wire wrapping techniques, base metals such as brass or stainless steel, and a variety of vintage Lucite pieces and semi precious stones. I use manufactured findings such as brass lockets, keys, die formed forks and spoons, and machine made ear wires for this line. My second production line is made of sterling and fine silver, gold fill wire in different colors, semi-precious stones and gemstones, with focal pieces like fused circles, snail, flower or bird silhouettes hand cut by me, handset stones in fine and sterling bezels, along with manufactured clasps and chains. Using manufactured chains and clasps for this line allows me to save a little time, and gives a finished and uniform look to many pieces. This line is most often oxidized, or darkened, to give the pieces an older feel. Darkening the silver increases its beauty, as most sterling silver tarnishes over time anyway, these pieces get more beautiful with wear and age. My third iteration of work is my Art Jewelry. What you see in most of my portfolio here is the third kind. This is my coursework over the many years I have been making jewelry and going to school to learn more about making jewelry. I use semi precious and precious metals, along with found objects, enamels and anything else that catches my fancy for this work as I explore topics including the body, sexual desire, the natural world, and the importance of pests.